A tariff is a tax on imported goods. The "border adjustment" proposed by Republicans in the House of Representatives (and sometimes mentioned by the Trump administration) as part of a corporate tax reform also involves a tax in imported goods. But they aren't the same thing, not at all, and it's useful to sort out the categories and understand why. Indeed, you can't understand the general direction of what seems likely to be President Trump's proposal for replacing the existing corporate income tax without knowing the difference. Most countries around the world and all high-income countries other than the United States have "border adjustments" in their tax code, but a key point to recognize is that border adjustments are typically part of a value-added tax--not the corporate income tax. A value-added tax is essentially similar to a national sales tax in its economic effects. However, instead of being collected at the time of purchase, like the sales taxes with which Americans are familiar, a value-added tax is collected from firms throughout their production process. For example, the common "credit invoice" VAT works like this: As a starting point, the firm calculates what the value-added tax would be if applied to all of its sales. However, every time a firm buys a good or service from an outside supplier, it receives an invoice, and on that invoice is recorded the VAT previously paid by the supplier. The firm starts with what it would need to pay if the the VAT rate was applied to all of its sales, but then subtracts out the value-added tax that was already paid by its suppliers at an earlier stage of production. Through this "credit invoice" method, the value-added tax is only applied to the "value-added" that the firm itself has created. Also, as a matter of enforcement, every time a firm buy inputs it has an incentive to make sure that the previous firm paid the value-added tax that was due at that earlier stage of production. It's important to notice that "value-added" is not equal to profits. The "value-added" of a firm includes both wages paid to its workers--who are the ones adding value, after all--as well as profits. To understand how the "border adjustment" comes into play, consider the situation across US states when different states have different sales tax levels: say state A has a sales tax of 5% and state B has no sales tax. If a firm based in state B makes a sale in state A, state A will charge sales tax on the product "imported" across the state border. But if a firm from state A sells in state B, then no sales tax is charged on the product "exported" to the other state. Similarly, imagine two countries with different rates of value-added tax. When imported goods arrive across international borders into a country with a value-added tax, they need to pay a border adjustment. The purpose is not to put imports at a disadvantage, but only to avoid giving imports a special advantage of being able to avoid the value-added tax. "Border adjustments eliminate the incentive to shift profitable production activities abroad simply to take advantage of lower foreign tax rates." To this point, the explanation answers one question, but opens up several others. The question that (I hope) is answered is why a tariff that places a tax on imports is different from a border adjustment. The typical border adjustment is not about disadvantaging imports relative to domestic production: it's just making sure that imports pay the same value-added tax as is paid by all other products in the country. The question that is opened up sounds something like: "But the US doesn't have a value-added tax, and so why does the idea of border adjustment even come up when talking about corporate tax reform?" The answer to this question is that the proposal from House Republicans for revising the corporate income tax is actually a first-cousin-once-removed of a value-added tax. The proposal is to eliminate the existing corporate profits tax, and then to replace it with what is sometimes called a "destination-based cash-flow tax." The "destination-based" language means that US corporations would be taxed base on the destination of where their goods are sold, not based on where they are produced. The "cash-flow tax" language means that the tax would look a lot like a value-added tax, except that firms would not need to pay the tax either on inputs purchased from other firms, and also not on wages paid to workers (as occurs in a standard value-added tax). Most countries have both a value-added tax and also a corporate income tax, viewing them as two different creatures. The proposal to install a destination-based cash flow tax as a replacement for the corporate income tax is in some ways a hybrid of the two. Alan Auerbach provides a readable academic discussion of how this kind of corporate tax can work in "A Modern Corporate Tax," published jointly by the Hamilton Project at the Brookings Institution and the Center for American Progress back in December 2010. He points to a number of advantages from this kind of change. "Most countries, including the United States, attempt to collect corporate taxes based on where a corporation’s profits are earned. The problems with this approach are that businesses and investments are increasingly internationally mobile and a business’s profits are intrinsically hard to attribute to a particular place; indeed, the fungibility of profits results in a system where a disproportionate share of the profits of multinational companies appear to occur in the world’s least-taxed countries. Current corporate tax systems generate incentives that result in the current environment where countries compete for multinational business activity by lowering their corporate tax rates. To remedy this situation, sales abroad would not be included in corporate revenue nor would purchases or investment abroad be deductible in the second major piece of the proposed corporate tax reform. As a result, the corporate tax would be assessed based on where a corporation’s products are used rather than where the corporation is located or where the goods are produced. Assessing the tax based on where a firm’s products are used eliminates issues of where to locate a business and incentives for U.S.-domiciled businesses to shift profits abroad to reduce U.S. taxes. "This plan therefore delivers a host of economic advantages to U.S. businesses and American workers. Promoting domestic corporate activity and encouraging investment would boost productivity, the key driver of increases in wages, employment, and living standards. Indeed, estimates of similar proposals suggest these changes could increase national income by as much as 5 percent over the long run. ... This new tax system also would retain or even increase the progressive element of the corporate tax system. The proposal would effectively implement a tax on consumption in the United States that is not financed out of wage and salary income." It's worth contrasting the ideas about corporate taxation here with the broader claim that this tax is one way that a Trump administration would "make Mexico pay for the wall." The border adjustment tax would apply to all imports, not just those from Mexico, for the reasons given above. As a consumption tax, it would raise prices to American consumers, who would be the ones paying for the tax. Assuming that it leads to a stronger US dollar, as pretty much all economists who study this subject expect, it won't end up affecting the US trade balance: basically, any effect of the border adjustment in reducing imports would be offset by a stronger dollar that will tend to raise imports by a roughly offsetting amount. For a quick question-and-answer about the destination-based cash flow tax, a useful starting point is the short essay by William Gale on "Understanding the Republicans’ corporate tax reform proposals," (January 10, 2017). I've known Bill Gale more than 30 years, since graduate school days, and lest I be accused of invoking his name in a partisan context, I should note he's an interplanetary distance away from being a Trump supporter. 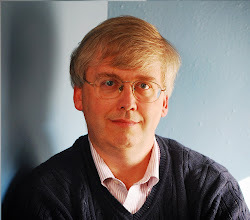 He points out a number of potential difficulties with the Trump proposal as it stands: it would raise a lot less revenue than the corporate income tax it is replacing; it may contravene World Trade Organization rules; if it leads to a stronger dollar it will simultaneously reduce the value (in US dollars) of investments that have been made in other currencies; and it could even mean that some large corporate exporters become eligible for big tax refunds. But he also writes: "The corporate tax is ripe for reform. The DBFCT is an excellent way to kick-start the needed discussion." In short, there's also a nubbin of a good idea here about reforming corporate taxes, although it has essentially zero to do with unfair trade, cutting better trade deals, reducing imports, or "making Mexico pay for the wall." If some suitable and substantial adjustments are made--starting with a higher tax rate than is included in the current proposal from the House Republicans--a corporate tax reform along these line is a potentially practical way of addressing many of the counterproductive incentives in the US corporate income tax. For example, US firms are currently holding about $2.5 trillion in cash outside the country, rather than bring it back and have it subject to the existing US corporate income tax. That's just one symptom of a deeper dysfunction with the US tax code. Correction: An earlier version of this post referred to the DBFCT proposal as being from the Trump administration. Although it has been mentioned at times by the adminstration, the proposal itself is actually from Republicans in the House of Representatives. The text has been revised above to reflect this change. 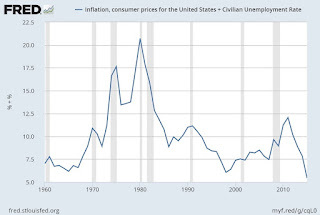 When unemployment and inflation both rose sharply during the "stagflation" of the 1970s, Arthur Okun came up with the "misery index," which is simply calculated by adding the unemployment rate and the inflation rate. (Okun was then at the Brookings Institution, and had previously been Chair of the Council of Economic Advisers at the tail end of the Johnson administration and a professor at Yale before that.) Okun certainly didn't view this little idea as any conceptual breakthrough, but it seemed a useful shorthand in his writing and speeches for characterizing some of what was happening in the 1970s. But the "misery index" came to broader prominence during the 1976 and 1980 presidential campaign, when it was first used by Jimmy Carter to criticize the state of the US economy under Gerald Ford, and then in turn used by Ronald Reagan to criticize the state of the US economy under Carter (here's a clip of Reagan making this point from the 1980 presidential debates). 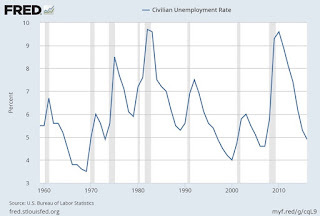 To see why it was an issue, here are three graphs: the annual unemployment rate over time, the annual inflation rate over time, and the "misery index" adding the two. You can see the spikes in 1976 and 1980. But you can also see that the misery index--which was a major factor in the 1976 and 1980 presidential elections--is at historically low levels. So why do so many people talk about the US economy in such near-apocalyptic terms? 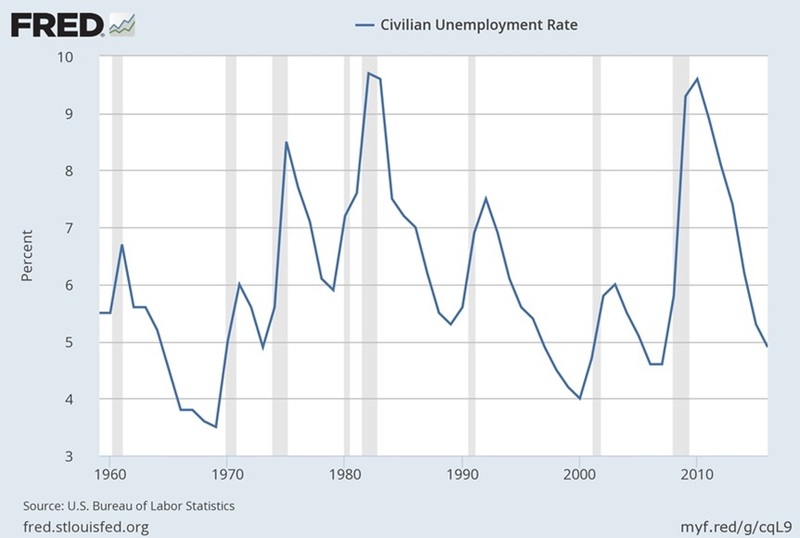 How did historically low rates of unemployment and inflation become seemingly irrelevant? I don't have a clear answer to this question, and indeed, the answer probably involves a cluster of factors. It's not just party politics. One might expect Republicans running against a Democratic incumbent to do all they can to make economic performance sound grim, but Bernie Sanders and Hillary Clinton were willing to speak up about how they saw US economic performance as grim. Maybe some of it is just ongoing shellshock from the Great Recession, but that recession did end back in June 2009. 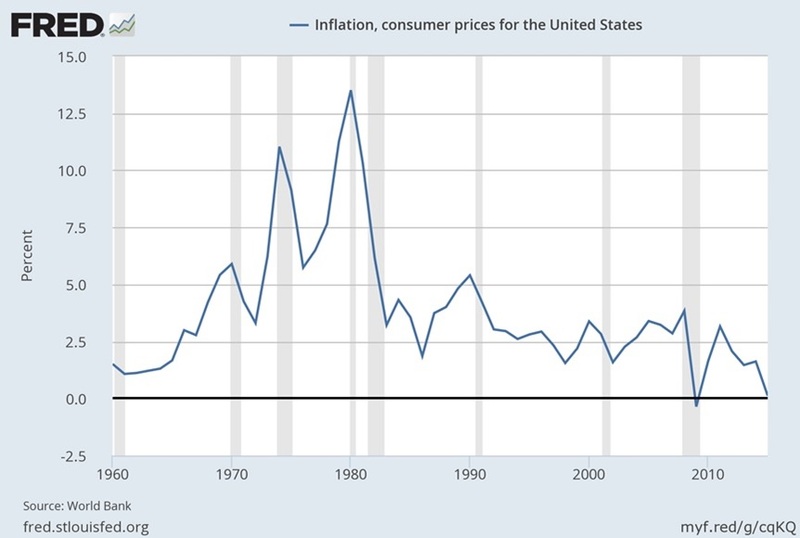 Some of it is that the US economy has no recent experience with significant inflation in the last 25 years, so boasting that inflation is low in 2016 would have sounded peculiar. Some of it is that when people vote in presidential elections, they seem to be influenced both by the rate of economic growth in the year leading up to the election and also by whether there have been some faster spurts of growth during some quarters of the previous four years. But while the upswing from the end of the Great Recession in 2009 has been uninterrupted, it has also been characterized by relatively slow growth in productivity and output. I think that a combination of slow growth and shifts in US labor markets are the main reasons why the misery index has become so irrelevant. A low unemployment rate doesn't feel like sufficient reason for satisfaction if the new jobs are mostly in the "alternative" workforce of contingent job arrangements, where there's no expectation of an ongoing relationship with an employer that can lead to building experience and knowledge and a career. When the economic pie is growing slowly and Americans are moving less, the high levels of inequality that have come to prevail become especially irritating. Such changes are often traced to modern economic forces like how job patterns are altered by robots and new technology, or by globalization. I've got no magic recipe for a US economy with better growth and more career-type jobs, although at some point I'll try to put together a collection of some ideas that might help. 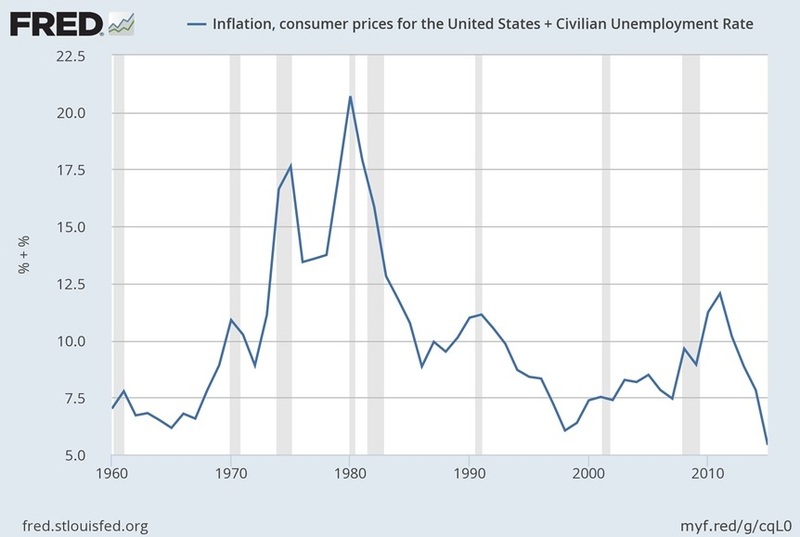 But I'm quite confident that American economic progress won't be found in trying somehow to sidestep or ignore 21st century technology and trade and instead striving to re-create 1970s jobs at 1970s wages--back when the misery index mattered. "CBO and JCT currently estimate that federal spending for people made eligible for Medicaid by the ACA [Affordable Care Act] will be $70 billion, or 0.4 percent of gross domestic product (GDP), in fiscal year 2017. Such spending is projected to rise at an average annual rate of about 7 percent, reaching $142 billion (or 0.5 percent of GDP) in 2027. ... The agencies also estimate net federal subsidies for coverage obtained through the marketplaces to be $49 billion, or 0.3 percent of GDP, in fiscal year 2017. Those subsidy amounts are projected to rise at an average annual rate of about 9 percent, reaching $110 billion (or 0.4 percent of GDP) in 2027." Seems like every week or two, I see a book or article about how the world economy is a disaster. Sometimes the thesis of the book is about too much reliance on markets; other times, too little reliance on markets. As a backdrop for all such claims, here's a figure showing GDP per capita since 1960 (in constant 2010 US dollars), created with the ever-useful FRED website run by the Federal Reserve Bank of St. Louis. 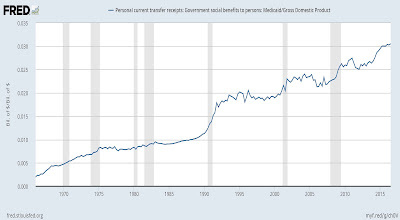 The annual growth rate works out to about 1.9% annual growth over the full 55 years. 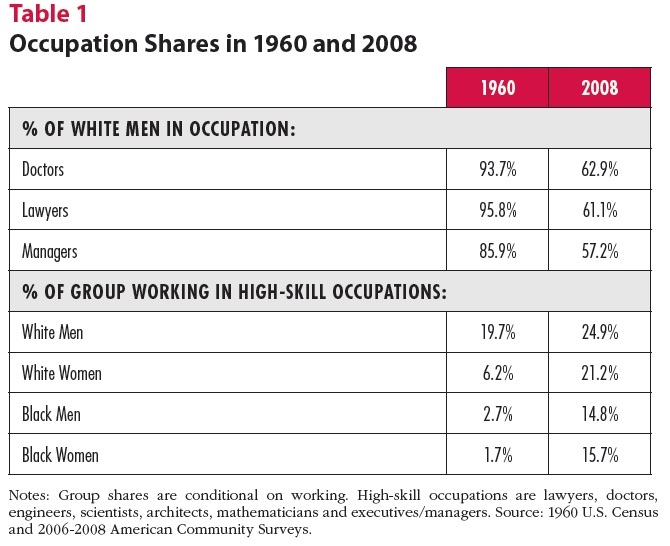 This figure shows the year-to-year percentage changes. 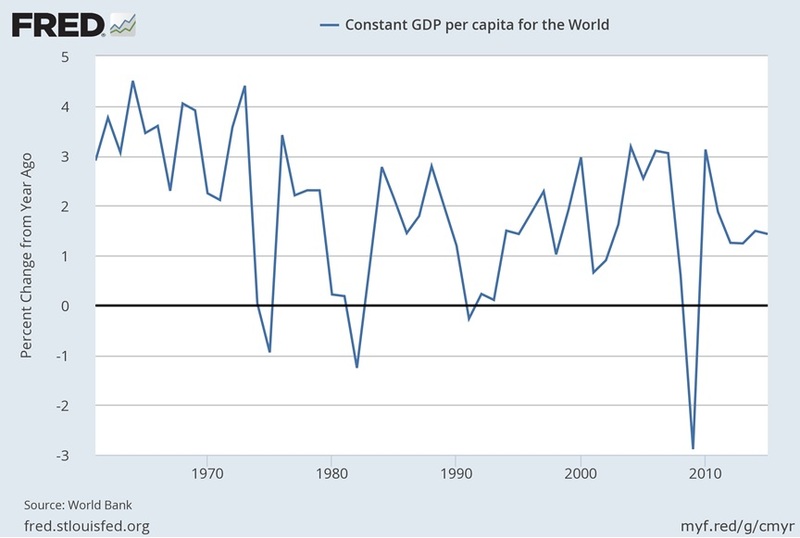 In the 1960s, the growth rate of world GDP was consistently above the long-run average, but since then, there have been years where it was lower and even negative. Of course, I'm aware that these kinds of figure don't settle any arguments. Some skeptics will argue that the gains would have been much larger if only their preferred policies had been followed. Some of those criticisms are surely correct. Other skeptics will argue that per capita GDP is a limited measure of welfare doesn't cover lots of topics of interest. They are surely correct. Still other skeptics will point out that there are severe measurement problems with GDP in the first place, and especially with comparisons of GDP across countries, and even more so with comparisons across countries and across time, so that these kinds of numbers involve a substantial margin of error. They are also correct. Some skeptics will go so far as to argue that per capita GDP is such a flawed statistic that it should be considered irrelevant to thinking about human well-being. They are incorrect. I don't take economic growth for granted. 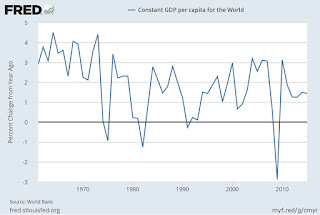 Confronted as I often am with claims that the world economy is sinking like the Titanic, I find the overall upward trend in per capita GDP during the last half-century to be moderately good news. How does international trade affect economic growth? This question has a pedigree. A half-century ago, it was common for economists to observe that the second half of the 19th century had seen a large wave of globalization and also a large wave of economic growth across many countries. Seemed as if the two might be connected! Back in 1970, the economist Irving Kravis challenged this consensus by drawing what has become a classic distinction in his article, "Trade as a Handmaiden of Growth: Similarities Between the Nineteenth and Twentieth Centuries," Economic Journal (December 1970, 80: 320, Dec. 1970, pp. 850-872). "Perhaps the most important role played by trade is one that cannot be measured by trade statistics, viz., that a relatively open market enabled the growing country to find its areas of comparative advantage and to avoid the development of insulated, high-cost, inefficient sectors. In their direct impact, however, trade and capital movements were supplementary factors; they were handmaidens not engines of growth. The mainsprings of growth were internal; they must be sought in the land and the people, and in the system of social and economic organisation." There's an ongoing argument in the research literature about how this argument applies to the 19th century evidence on globalization and growth. Those who are interested in the historical arguments can start by taking a look at "Trade as a Handmaiden of Growth: An Alternative View," by N. F. R. Crafts in the Economic Journal (September 1973, 83: 331, 875-884). Here, I want to focus on the implications of Kravis's distinction at present. If trade is a main engine of growth, then it becomes important for trade to keep expanding as a share of GDP. If trade is a handmaiden of growth, then the presence of vigorous international trade is important, because it avoids what Kravis called "the development of insulated, high-cost, inefficient sectors," but continual expansions of trade don't matter nearly as much. 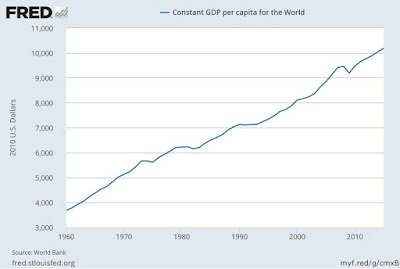 It's of course clear in the time since Kravis's 1970 essay, certain countries like Japan, Korea, and China have experienced a wave of economic growth that is related to their access to international markets. However, it's also clear that those countries have had very high levels of investment, as well as boosting the educational attainment and human capital of their population and being very willing to seek out and adopt new technologies. The US has had a large rise in its exports and imports in recent decades as a share of GDP, but economic growth in the US has fluctuated: fast in the 1960s, slow for much of the 1970s and 1980s, a surge roughly a decade long starting in the mid-1990s, and a growth slowdown since then. Up through about 2008, it was fair to say that the US economy has had the globalization, but not a corresponding large and sustained surge of productivity growth as a result. Since then, the US has experienced both a slowdown in trade growth and a slowdown in productivity, but of course this correlation doesn't prove a causal connection between the two. 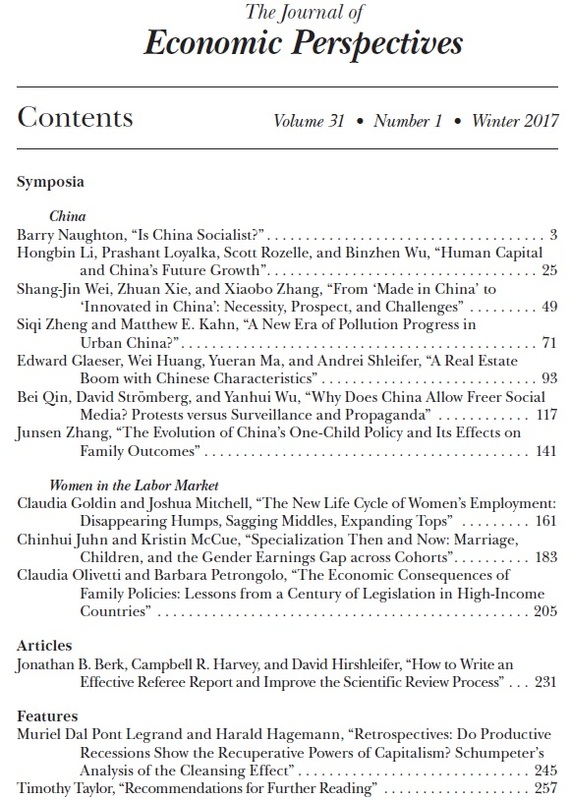 For a modern overview at the relationship between international trade and productivity, Gary Clyde Hufbauer and Zhiyao (Lucy) Lu lay out the background in "Increased Trade: A Key to Improving Productivity" (October 2016, Peterson Institute for International Economics Policy Brief 16-15). They point out:"Global trade growth slowed abruptly after 2010, following decades of expansion." They also offer a nice overview of recent developments in trade theory. (Those who would like more on developments in trade theory might begin with the four-paper symposium in the Spring 2012 issue of the Journal of Economic Perspectives.) Toward the end of the paper, they develop a rule-of-thumb for measuring the gains from trade. efficiencies, by $240 million. ... Between 1990 and 2008, real US two-way trade in nonoil goods and services increased at an average rate of 5.86 percent a year. If two-way trade had increased at this pace after 2011, the real value of US two-way nonoil trade in 2014 would have been $308 billion greater than the observed value ($4.50 trillion versus $4.19 trillion). Based on the average dollar ratio of 0.24, the hypothetical increase in US two-way trade would have delivered a $74 billion increase in US GDP through supply-side efficiencies in 2014." If you put this number in context, it's may not seem especially large. The US GPD was roughly $17 trillion in 2014, so an efficiency gain of $74 economy is less than half of 1%. To put it another way, say that size of US trade as a percentage of GDP increases by 0.4% per year over time. Then about one-fourth of that amount (the .24 figure from the Hufbauer and Lu estimates) represents an efficiency gain. By this quick-and-dirty measure, trade might add 0.1% per year to the US growth rate. Even that estimate may be too high, because the effects of trade on productivity and growth are likely to differ quite substantially across countries. A boost in trade for a small economy that has been closed off from competition can help bring that economy into global supply chains, in a way that spurs growth through access to global technology and global markets. But the US is a very large economy with a reasonably competitive domestic market. For that kind of economy, an additional trade agreement is going to likely to have a much smaller effect. A number of studies (going back to Kravis and earlier) point out that trade may be of greater relative important for smaller economies, just as the North American Free Trade Agreement had a much larger positive effect for Mexico than the US economy. But on the other side, the cautious reader may have noted that the Hufbauer-Lu estimate views trade from the "engine of growth" perspective: that is, the gains from trade come from expansions of trade, not from the "handmaiden of trade" effects like a competitive incentive for domestic firms to improve their efficiency and to focus on expanding into areas where their efficiency advantages are greatest, or the efficiency gains from trade that arise from learning more about other markets and technologies--even if trade itself isn't expanding. It's also worth remembering that even seemingly small productivity gains, on the order of 0.1%, are cumulative over time. If several policies are all undertaken that can each raise growth by 0.1% per year, then after a few years the additional growth compounds to an economy that is noticeably bigger. A one-time gain of 0.1% of GDP in one year isn't a lot, but a permanent and ongoing gain of 0.1% of GDP every year is actually of meaningful if modest importance. Overall, the world may have reached a pause in globalization, defined here as a rise in trade relative to GDP. In that sense, trade as an engine of growth has probably slowed. In addition, the gains for the US economy from signing additional trade agreements, given the enormous size and vast internal trade already present within the US economy, are not likely to be large--and certainly not large in the short-run. Long-run growth for the US economy is more likely to be based on investments in human capital, physicial capital, and technology. For smaller economies around the world, the possibility of greater participation in global markets can be considerably more important to their economic growth. For both large economies like the US and smaller economies around the world, the role of existing levels of international trade as a handmaiden of growth, providing competition and incentives and a check on industries that without such competition can become "insulated, high-cost, inefficient sectors," remains important. What if Trump Skeptics, Like Me, Turn Out To Be Wrong? I would have said that the Berlin Wall would not come down in my lifetime. I would not have believed that the nations of Europe, and Germany in particular, would ever give up their traditional currencies for the euro. 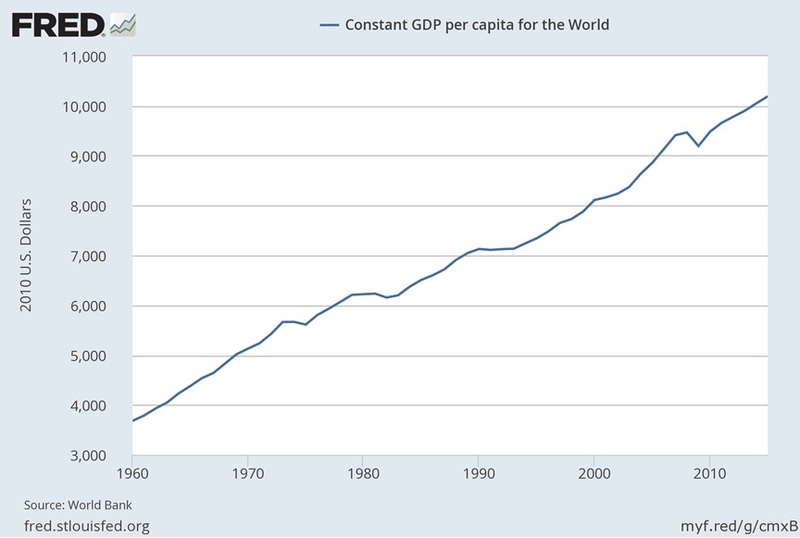 I would not have believed that China would within a few decades become the largest economy in the world. I would not have believed that the Federal Reserve would take the federal funds interest rate down to near-zero and leave it there for seven full years. I would not have believed that the real estate developer who in 1983 opened Trump Tower in Manhattan and in 1984 opened the Harrah's casino at Trump Plaza in Atlantic City would ever become the President of the United States. Just to be clear, I wouldn't have just said back in the first half of the 1980s that these events were merely unlikely. I would have viewed them as essentially unthinkable. Additions to this "I would not have believed" list are welcome: send them to conversableeconomist@gmail.com. For example, one friend contributed: "I would not have believed that the US presence in space would end up being spearheaded by the private sector." It seems to me a useful mental discipline to admit when you are wrong--and especially when your errors demonstrate a substantial failure of imagination. Donald Trump was not my preferred or expected choice, either among those running for the Republican nomination or in the presidential election. I fear some of the potential consequences of his election. But I can clearly be wrong on major events, and I could be wrong about the effects of a President Trump, too. These statements are not intended as predictions of what will or won't happen. My mother didn't raise any sons silly enough to make definite predictions about the future in print, and I have not tried to put a personal probability estimate on these outcomes. They are just possibilities. Of course, one can expand this list to include an array of other issues: what will happen in foreign policy hotspots from China and Latin America to the Middle East; patterns of economic and social inequality; fair treatment under the law for every single American; and many more. On this Inauguration Day for President Donald Trump (and frankly, I still can't believe I am writing those words), I sincerely hope that I will turn out to be deeply incorrect about his readiness and fitness for office. I will try to observe what happens during a Trump administration clearly, without distortion through the prisms of my fears and disbeliefs, and without trying to justify my preexisting skepticism. After all, I've been wrong on big topics before. "The Medicaid program covers more than 70 million Americans, or 1 in 5, including many with complex and costly needs for care. 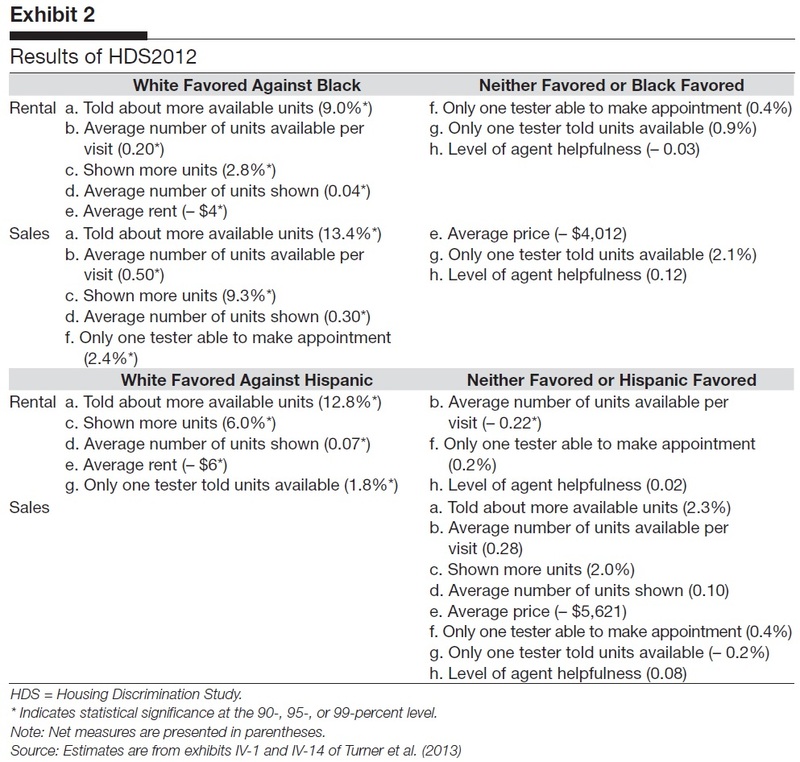 ... Medicaid covers a broad array of health services and limits enrollee out-of-pocket costs. The program is also the principal source of long-term care coverage for Americans. ... 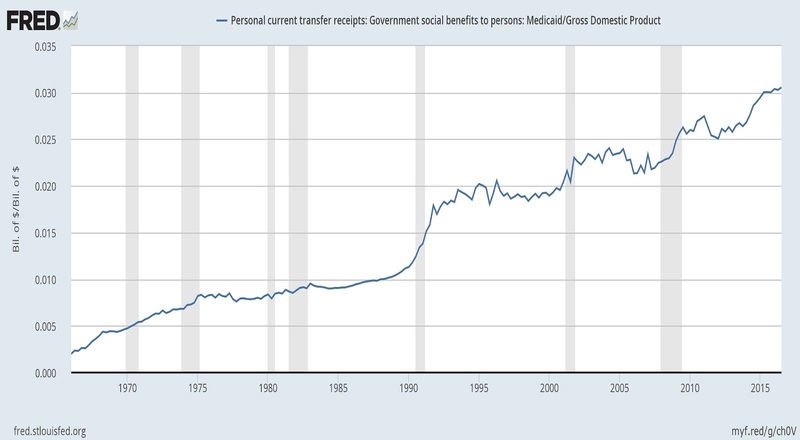 The Medicaid program finances over 16% of all personal health care spending in the U.S. .. Under a 2012 Supreme Court ruling, the ACA Medicaid expansion is effectively optional for states. As of January 2017, 32 states including DC had expanded Medicaid and 19 states had not. ... Between Summer 2013, just prior to the ACA coverage expansions, and October 2016, Medicaid and CHIP enrollment rose by nearly 17 million. In 2015, an estimated 11 million enrollees were adults newly eligible for Medicaid under the ACA expansion and this number has likely grown as enrollment has continued to rise and additional states have expanded Medicaid. A few points are worth unpacking here. It's common in public discussions to refer to Medicaid as health insurance "for the poor," but that has never been quite correct. 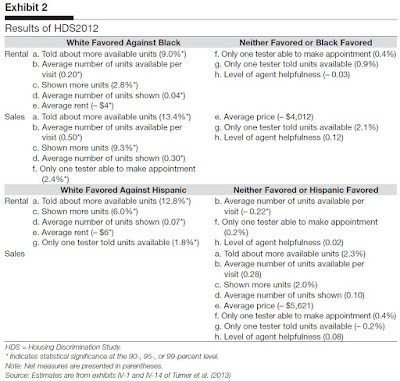 Adults without children have historically not been eligible for Medicaid, whether they were poor or not. Here are a couple of figures from the Kaiser report to illustrate the point. For example, the first bar shows that for the nonelderly below 100% of the federal poverty line, only 54% are covered by Medicaid, which as later bars show is breaks down into 76% of children and 40% of adults below the poverty line. In fact, most Medicaid spending isn't aimed at the non-elderly poor. Here's another breakdown from Kaiser, showing that the disabled are 15% of Medicaid recipients, but receive 42% of all Medicaid spending, while the elderly are 9% of all Medicaid recipients, but receive 21% of all Medicaid spending (much of it for long-term care services). The expansion of Medicaid enrollments has of course led to an increase in spending in what was already a very large program. The Kaiser report notes: "Total federal and state Medicaid spending was about $532 billion in FY 2015. Medicaid is the third-largest domestic program in the federal budget, after Social Security and Medicare, accounting for 9% of federal domestic spending in FY 2015. Medicaid is the second-largest item in state budgets, after elementary and secondary education, accounting for 18.7% of state general revenue spending and 28.2% of total state general revenue spending including federal funds to states, in 2015." The Congressional Budget Office estimated last March that the expanded Medicaid enrollments in the Patient Protection and Affordable Care Act cost $67 billion per year. One contributing factor is that the cost per patient of Medicaid expansion is turning out to be about 50% higher on a per capita than the earlier estimates, coming in at just over $6,300 per person, according to estimates last August from the Centers for Medicare and Medicaid Services. Medicaid costs have climbed substantially over time as a share of GDP, from less than 0.5% of GDP when the program got underway in the late 1960s to more than 3% of GDP at present. These patterns perhaps offer some useful context as the arguments over altering the Patient Protection and Affordable Care Act of 2010 gather momentum. As I've noted before, there's never been any secret that if the government was willing to spending tends of billions of dollars, it could expand health insurance coverage for millions of people. Because I view the lack of health insurance coverage as a genuine problem, I'm fine with additional spending to expand Medicaid. When President Obama addressed Congress about the pending health care legislation on September 9, 2009, he said: "So tonight, I return to speak to all of you about an issue that is central to that future -- and that is the issue of health care. I am not the first President to take up this cause, but I am determined to be the last." Even in September 2009, the notion that the US health care system could have a once-and-for-all fix was more of a rhetorical flourish than a practical reality. But given the form the actual legislation ended up taking, and given what has happened in the almost seven years since it was signed into law, the set of programs, regulations, and tax provisions affecting the US health care system clearly need some changes. 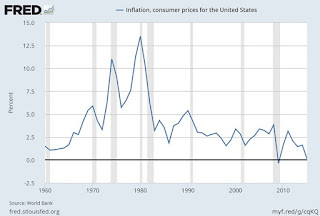 "Price discrimination" has a specific technical meaning for economists. It's not about sellers charging more to certain groups because of biased attitudes about gender, race/ethnicity, religion, or sexual orientation. Instead, it's about setting up a varying set of prices in order to charge more to those who are willing to pay more--unlike the standard situation in a plain vanilla market in which everyone pays the same price. There are lots of examples of price discrimination. When a movie is first released, the ticket prices are typically higher in "first-run" theaters than when the movie arrives at "second-run" theaters a few months later. Books are often released first in more-expensive hard-cover editions, and later in less-expensive paperbacks. Those who aren't sure about going out for dinner are enticed by happy hour and early-bird specials, while those willing to pay more arrive later in the evening. There are discounts for students or senior citizens. There are volume discounts for buying a larger quantity of a good. Such arrangements often seem potentially beneficial to both buyers and sellers. "Economics textbooks usually define three types of differential pricing. Personalized pricing, or first-degree price discrimination, occurs when a seller charges a different price to every buyer. Individually negotiated prices, such as those charged by a car dealer, are an example of personalized pricing. Quantity discounts, or second-degree price discrimination, occur when the per-unit price falls with the amount purchased, as with popcorn at the movie theater. Finally, third-degree price discrimination occurs when sellers charge different prices to different demographic groups, as with discounts for senior citizens. Ultimately, whether differential pricing helps or harms the average consumer depends on how and where it is used. In a competitive market with transparent pricing, the benefits are likely to outweigh the costs. ... Ultimately, differential pricing seems most likely to be harmful when implemented through complex or opaque pricing schemes designed to screen out unsophisticated buyers. For example, companies may obfuscate by bundling a low product price with costly warranties or shipping fees, using “bait and switch” techniques to attract unwary customers with low advertised prices and then upselling them on different merchandise, or burying important details in the small print of complex contracts.When these tactics work, the economic intuition that differential pricing allows firms to serve more price-sensitive customers at a lower price-point may even be overturned. If price-sensitive customers also tend to be less experienced, or less knowledgeable about potential pitfalls, they might more readily accept offers that appear fine on the surface but are actually full of hidden charges. ...."
"As the volume, variety and value of personal data increases, self-learning pricing algorithms can use the data collected on you and other people to identify subgroups of like-minded, like-price-sensitive individuals, who share common biases and levels of willpower. Pricing algorithms can use data on how other people within your grouping react, to predict how you will likely react under similar circumstances. This then enables the self-learning algorithm to more accurately approximate the user's reservation price, observe behaviour, and adjust. The more time we spend online--chatting, surfing, and purchasing--the more times the algorithm can observe what you and others within your grouping do under various circumstances; the more experiments it can run; the more it can learn through trial and error what your group's reservation price is under different situations; and, the more it can recalibrate and refine (including shifting you to another group). "To better train their algorithms and categorize even smaller groups of individuals, firms will need personal data. Among other things, this trend will accelerate the "Internet of Things", as firms compete to collect data on consumers' activities at home, work, and outside. Smart appliances, cars, utensils, and watches can help firms refine their consumer profiles and gain a competitive edge. Thus in making use of our demographics, physical location (via our phones), browser and search history, friends and links on social networks, and online reviews and blog posts, firms can target us with personalised advertisements with ever increasing proficiency. Also, at the point of sale, the categorisation can help sellers approximate our price sensitivity." It used to be said that when you go to a website, you are like a person with a name-tag at a convention: that is, you could be identified, but others didn't necessarily know much about you. But in the future, when you go to a website, certain sellers at least will already know a great deal about you. With this information, the seller will be able to customize your retail experience by manipulating the information presented about products, choices, prices, and deals in ways that makes someone with your specific characteristics more likely to buy and to pay higher prices. This could be done in literally dozens of ways. One example from Ezrachi and Stucky is that the first item presented in an online list of possibilities will both be a decoy designed with your characteristics in mind: it will also be higher-priced, and perhaps lacking in some features. When you scroll down the list, you will find other items that have lower prices or more features. Compared to the decoy item, these look like good deals. A standard example in regular retailing is that many restaurants report that the second most-expensive bottle of wine and the second least-expensive bottle of wine are among their top seller, because those who want to splurge can feel they are being a little thrifty, and those who want inexpensive can feel they aren't being totally cheap. "So we may have originally intended to purchase a cheaper item, but chose a more expensive item with perhaps a few more attributes, as it was relatively more attractive than the personalised decoy option." the customers' switching costs and increase the likelihood of customers retaining the personalised default option. This enables firms to inch closer to perfect behavioural discrimination." The road to near-perfect behavioural discrimination will be paved with personalised coupons and promotions: the less price-sensitive online customers may not care as much if others are getting promotional codes, coupons, and so on, as long as the list price does not increase. Online sellers will increasingly offer consumers with a lower reservation price a timely coupon-ostensibly for being a valued customer, a new customer, a returning customer, or a customer who won the discount. The coupon may appear randomly assigned, but only customers with a lower reservation price are targeted. Indeed, the price discrimination can happen on other, less salient aspects of the purchase. Retailers can offer the same price, but provide greater discounts on shipping (or faster delivery), offer complimentary customer service, or better warranty terms to attract customers with lower reservation prices, greater willpower, or more outside options. In the brave new world of big data and online purchases. buyers really do need to be wary. And one suspects that the Federal Trade Commission and other consumer protection agencies are going to become active participants in determining what tools sellers can use.